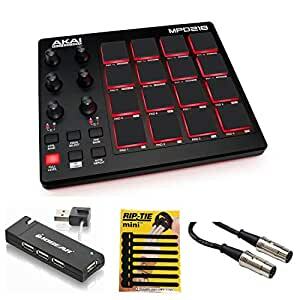 The Akai Professional MPD218 USB Pad Controller is a MIDI-over-USB pad controller which brings the feel of classic MPC beat-making to producers, programmers, musicians and DJs, in a lightweight and compact package. Sixteen ultra-sensitive Thick Fat backlit MPC pads are used to trigger drum hits and other samples in your software or external MIDI sound module, and are pressure- and velocity-sensitive, for a responsive feel and intuitive playing. You can switch between three pad banks to control up to 48 samples. The MPD218 features 3 banks of 6 assignable 360Â° potentiometers which send continuous controller messages to the software for up to 18 parameters. The controller incorporates some of the MPC’s most popular functions such as a Note-Repeat button and Full-Level mode. The unit is bus-powered and class-compliant with Mac and Windows, and is iOS-compatible via Apple’s Camera Connection kit (available separately). It comes with a comprehensive software bundle which includes Ableton Live Lite, Akai Pro MPC Essentials, Sonivox Big Bang Cinematic Percussion & Big Bang Universal Drums, and Software Preset Editor.